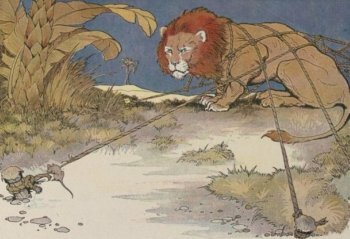 The Lion and the Mouse is a favorite Aesops Fable about kindness. It's hard to always be kind. Sometimes you just don't feel like it! This fable reminds us that we better be nice even when it's hard or we don't feel like it because we may need some kindness too someday! A timid little Mouse came upon him unexpectedly, and in her fright and haste to get away, ran across the Lion's nose. Some days later, while stalking his prey in the forest, the Lion was caught in the toils of a hunter's net. "Treat others as you would like to be treated." This short short story illustrates that saying pretty well. The female lion does almost all of the hunting but lets the male eat first - now that's showing some kindness! When a lion and a tiger get married they have a baby called a "tiglon". A baby mouse is called a kitten - isn't that ironic!? A daddy mouse is called a buck. A mommy mouse is called a doe. Hmmm, I thought we were talking about mice, not deer? If you grab a mouse by the tail you may loose it because the tip can come off!